In case of the EUR/USD currency pair, despite the correction which is taking place at the moment, still there is a possibility that the price may fall down toward new minimums. At the weekly chart of the pair the RSI indicator faced the resistance from the trend’s descending line, we should expect it to rebound from the line and start moving downwards. The price testing the area, where the trend’s rising line has been broken at the price chart, is an additional signal to sell the pair. At the daily chart of the pair we can see that the descending pattern with the target in the area of 1.2760 still remains in effect. One can consider selling the pair with the tight stop if reversal signals appear at shorter periods of time. If the price leaves the descending channel, this case scenario will be cancelled and we should expect the start of the significant rising trend. 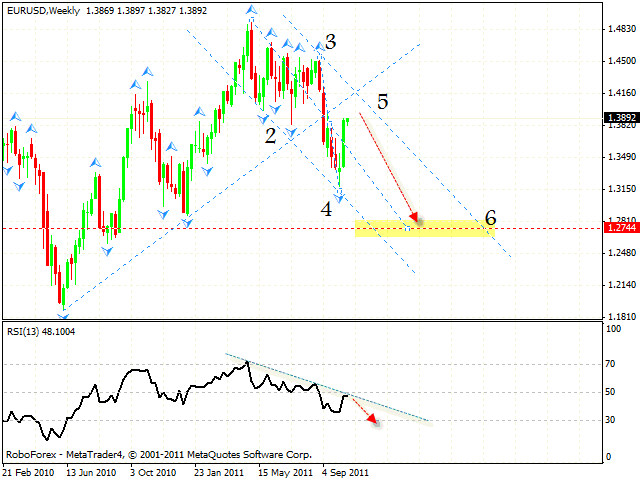 Pound is also forced to move downwards, as long as the RSI indicator is below the trend’s descending line. 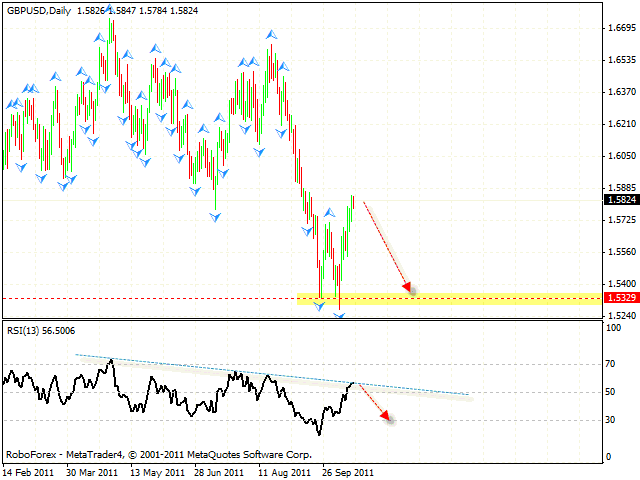 One can try to sell the GBP/USD currency pair with the tight stop. 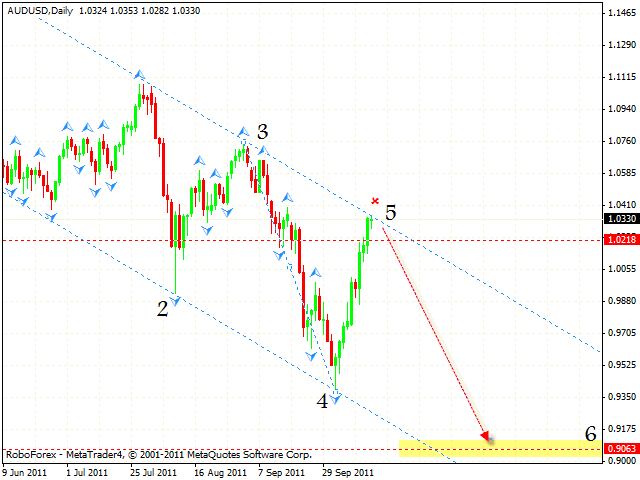 The target of the fall is the support area at the level of 1.5330. If the price breaks the trend’s line at the RSI, we should expect the start of the rising movement with the target in the area of 1.6370. 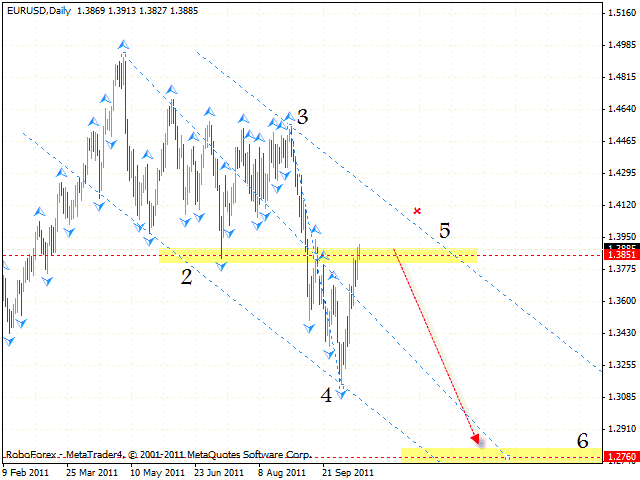 Franc is about to test the trend’s rising line, one can try to buy the pair with the tight stop. 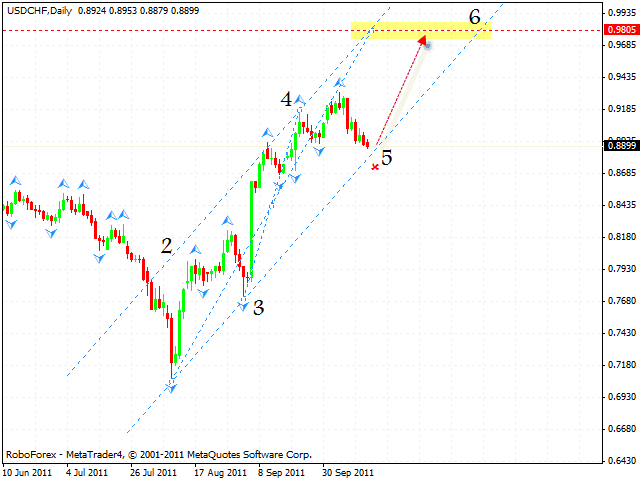 At the moment we can see the formation of the rising pattern with the target in the area of 0.9805. If the price breaks the rising channel’s lower border, this case scenario will be cancelled. Australian Dollar keeps moving inside the descending pattern with the target in the area of 0.9060. The price is testing the area of the 5th pivot point, we should expect the AUD/USD currency pair fall down and continue to moving downwards. One can try to sell the pair with the tight stop. If the price breaks the descending channel and leaves it, this case scenario will be cancelled.